This was one of the deadliest nightclub fires in history. The Cocoanut Grove was Boston's premier nightclub during the post-Prohibition 1930s and 1940s. 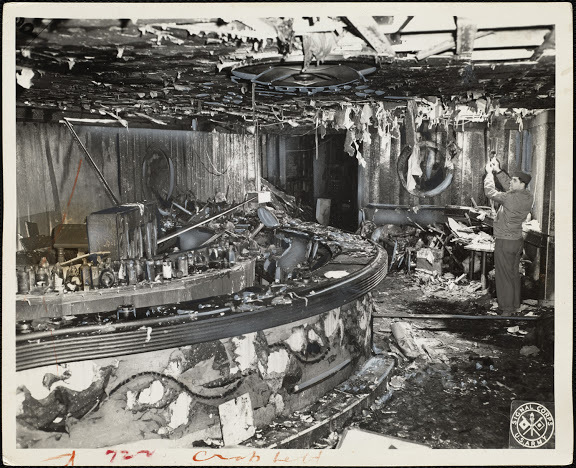 The source of the fire is unknown, though it was believed that a young man, possibly a soldier, had removed a light bulb in order to create some privacy while kissing his date, which may have been connected to the source of the flames. The blaze killed all 492 people within the building and injured hundreds more. The side doors of the venue had been bolted shut to prevent people from leaving without paying their bill, and it is theorized that if the doors to the club had swung outward instead of inward, over 300 lives could have been saved. Slow as molasses? Not so much. 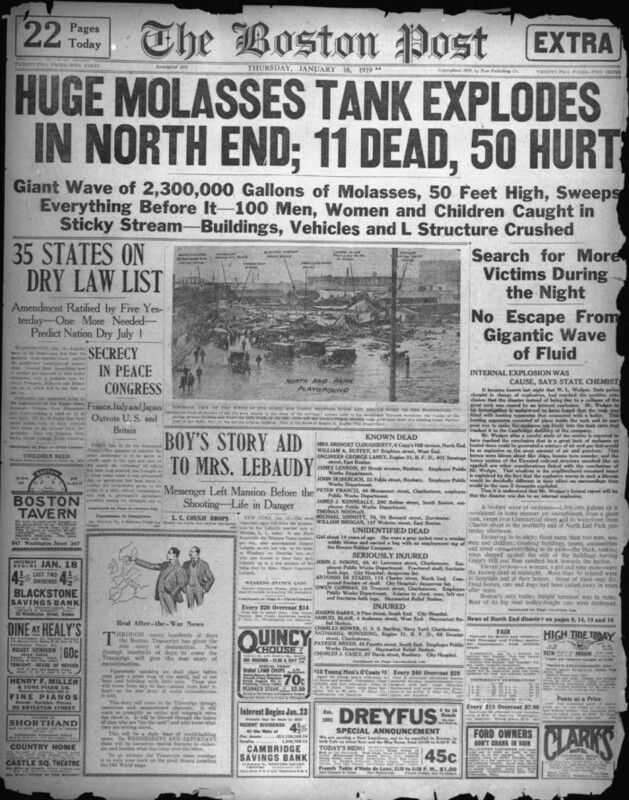 On January 15, 1919, in the North End neighborhood of Boston, a large molasses storage tank burst and a wave of molasses swept through the streets at an estimated 35 mph, killing 21 and injuring 150. 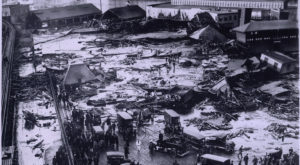 The tank contained over 2,300,000 gallons of molasses and as the wave hurtled through the streets, nearby buildings were swept off their foundations and crushed. 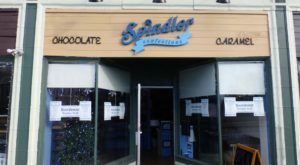 For decades afterward, residents claimed that on hot summer days the area still smelled of molasses. 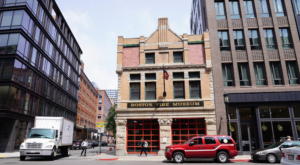 This terrible event was Boston's largest urban fire, and still ranks as one of the most costly fire-related property losses in American history. The blaze began on the evening of November 9, 1872, in the basement of a warehouse on Summer Street. 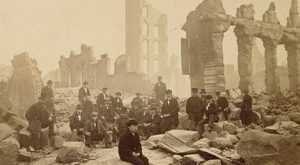 The fire raged for 12 hours and consumed about 65 acres of Boston's downtown, including almost all of the financial district. At least 30 people died in the inferno, though the true number may be higher. A number of factors made responding to the fire difficult. 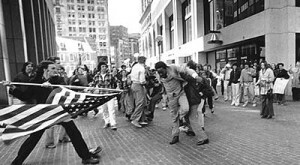 A horse flu outbreak had affected many of the Boston fire department horses and many looters and bystanders actually tried to stop firemen from extinguishing the flames. This storm was one of the most severe recorded blizzards in the history of the United States of America. 20-60 inches all along New England, with Massachusetts sustaining particularly heavy damage. Winds of more than 45 miles per hour produced snowdrifts taller than 50 feet. Some people were stuck in their houses for more than a week, unable to exit through their snow-clogged doorways. 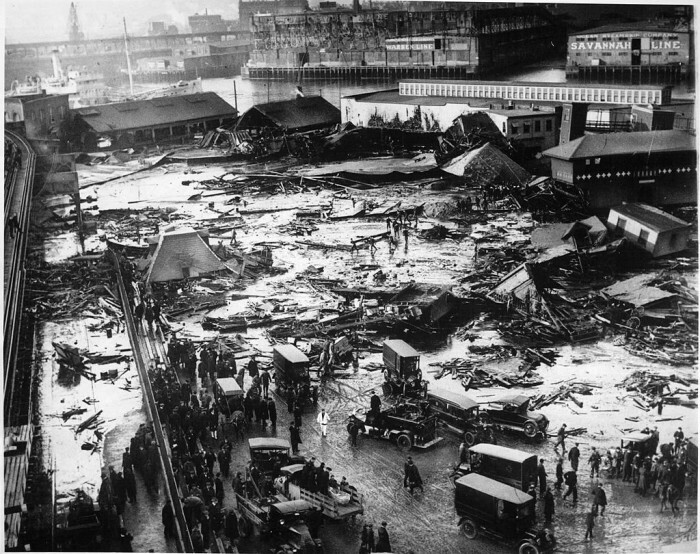 Around 400 people in the Northeast died during the course of the blizzard and its aftermath, and more than 100 people died at sea after 200 ships sank off the East Coast. 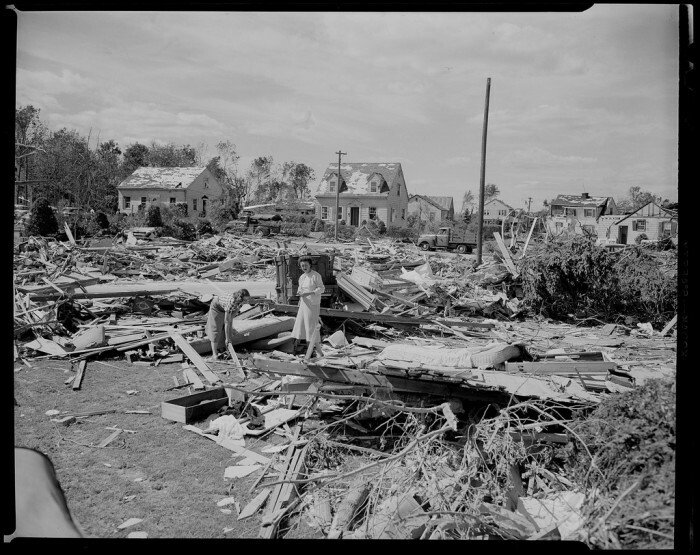 On June 9, 1953, an extremely powerful tornado struck the city and surrounding area of Worcester, Massachusetts. The tornado stayed on the ground for 90 minutes and traveled 48 miles across Central Massachusetts. 94 people were killed, making this tornado the 21st most deadly in the history of the United States. The storm destroyed Assumption College and left over 10,000 people homeless. 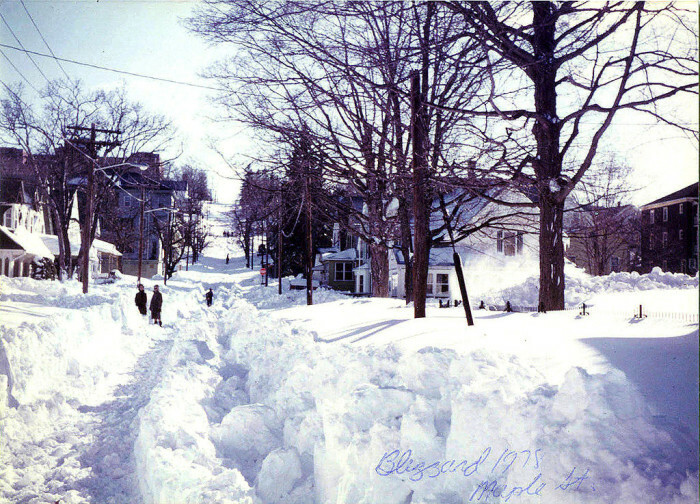 Almost 100 years after the blizzard of 1888, Massachusetts survived the blizzard of 1978. The storm itself lasted from February 5 to February 7, and it was one of the most catastrophic nor'easters ever to occur in the state. The storm killed about 100 people in the Northeast and injured a whopping 4,500. 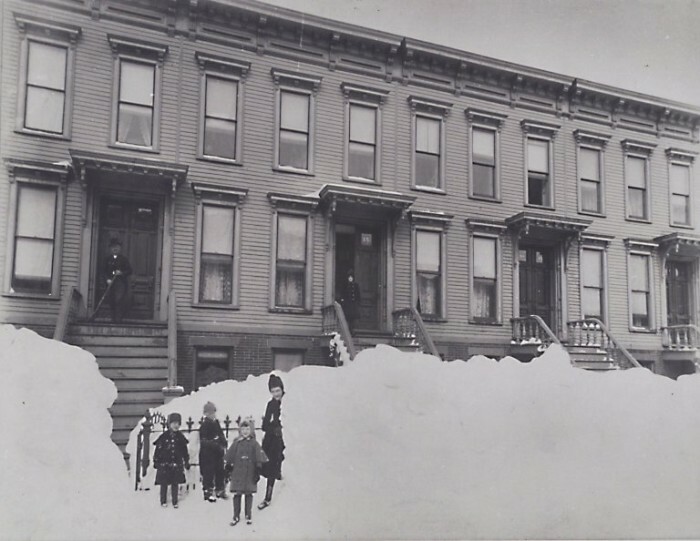 Adjusted for inflation, the damages caused by the blizzard would amount to $1.89 billion today. While a typical nor'easter only lasts in full force for about 6 to 12 hours, this storm raged for a full 33 hours. 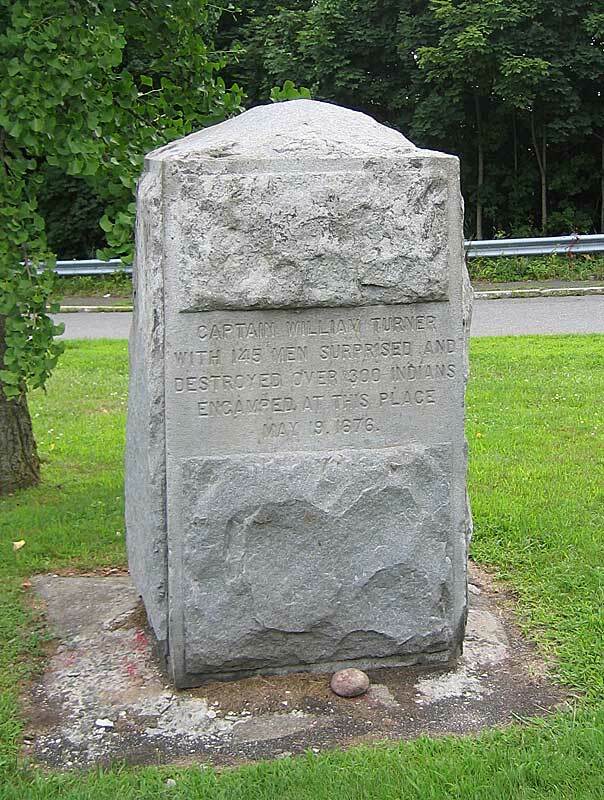 On the sleepy morning of May 19, 1676 in present-day Gill, Massachusetts, a band of English colonists under the command of Captain William Turner fell upon the poorly guarded Indian village of Peskeompscut near the falls at dawn, slaughtering many of its inhabitants. 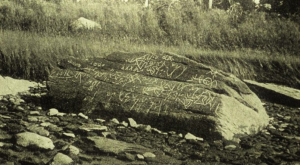 More than 300 native people were killed (including many women and children), while only one colonist died in the surprise attack. There is still a marker commemorating the incident in Gill. 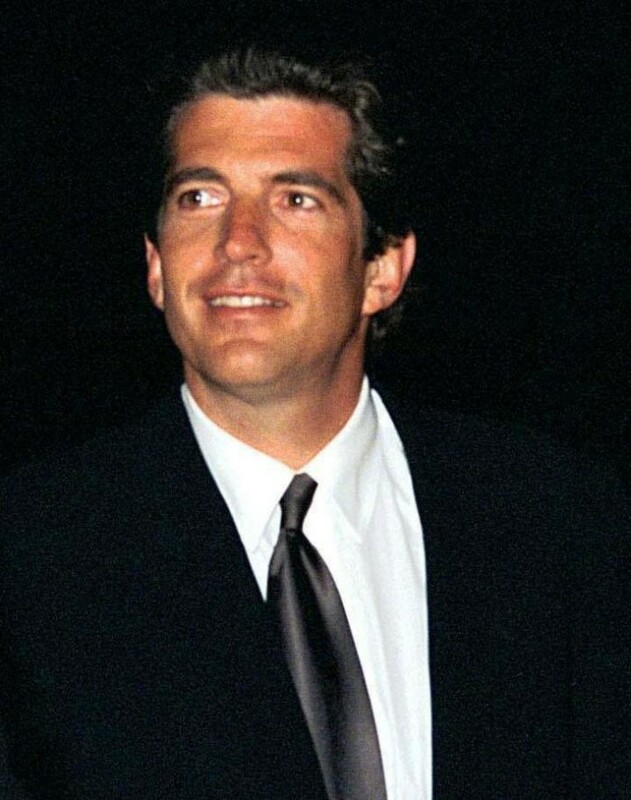 On July 16, 1999, John F. Kennedy Jr. died when the airplane he was piloting crashed into the Atlantic Ocean off the coast of Martha's Vineyard, Massachusetts. The two passengers on board, Kennedy's wife Carolyn Bessette and her sister Lauren, were also killed. The trio were en route to attend the wedding of JFK Jr.'s cousin Rory Kennedy. Investigators concluded that Kennedy had become disoriented while descending at night over the water and had lost control of the aircraft. 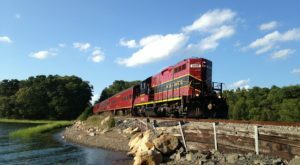 On the evening of August 26, 1871, the Eastern Railroad's Portland Express slammed into the rear of a stopped local train in Revere, Massachusetts. It is reported that the night was very dark and the engineer of the express thought the lights on the rear car of the stopped local train were from the station's lamps. The express managed to slow to 10 miles per hour, but at that point the collision had become unavoidable. 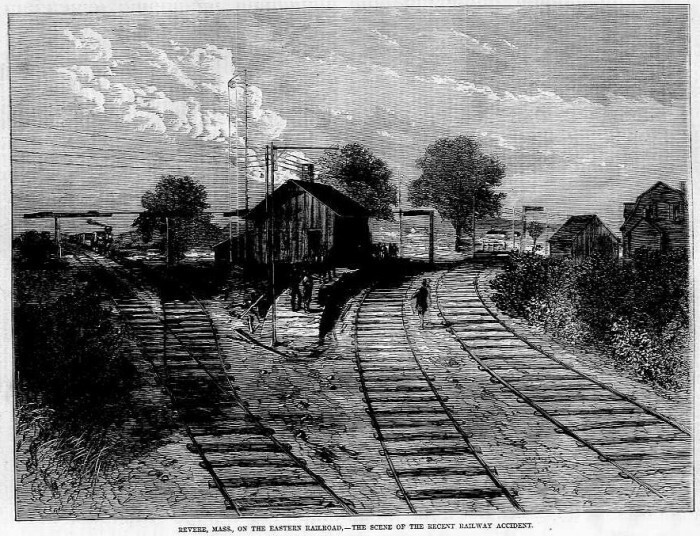 The express train’s steam boiler exploded and about a dozen people were either crushed to death by the boiler or scalded by the escaping steam and hot water. Some trapped passengers were burned alive as coal-oil lamps ignited the wreckage. Approximately 29 people died, while several others were injured. 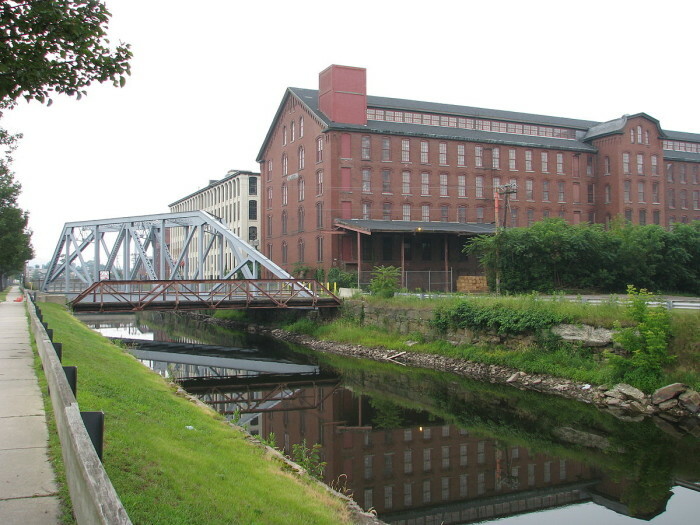 The collapse of Pemberton Mill has been deemed the worst industrial accident in Massachusetts history and one of the worst industrial disasters in American history. On January 10, 1860, the large factory in Lawrence collapsed without warning. An estimated 145 workers were killed and 166 injured. To add to the horror, someone accidentally knocked over an oil lantern during the rescue efforts. The flames caught on the mounds of cotton waste and splintered wood, turning the wreckage into an inferno with many survivors still trapped in the refuse and burned alive. Many of the workers at the mill had been women and young children. Sadly, none of us need reminding of this one. 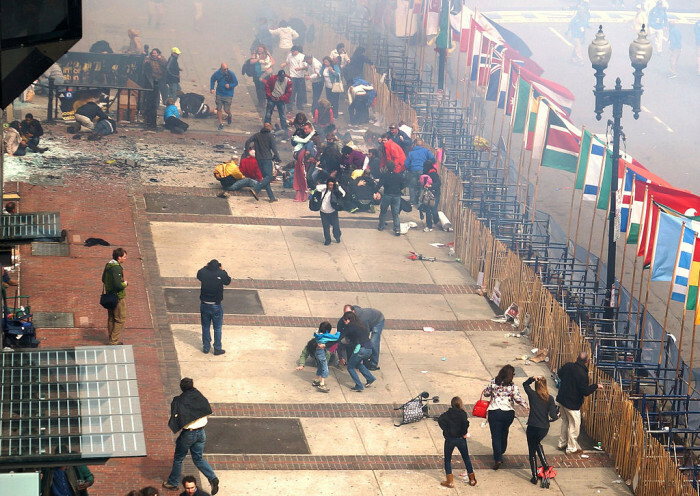 On April 15, 2013, two pressure cooker bombs planted by Chechen brothers Dzhokhar Tsarnaev and Tamerlan Tsarnaev exploded during the Boston Marathon near the marathon's finish line on Boylston street. The bombs killed 3 and injured an estimated 264 others. These horrifying disasters won’t soon be forgotten.